Perhaps you’ve gotten frustrated in searching for the perfect cat food. You might feel betrayed to find that the pricey gourmet cat food that advertised itself as being super healthy and all natural is little better than spicy wood pulp. Not only do you have to find a cat food that’s nutritionally sound and in your budget, but it has to be something your furry but finicky friend will eat. It could be you’re ready to throw up your hands and say “Forget it! I’ll cook my cat’s food myself!” This is really not a bad idea, provided you know what you’re doing. Why Should You Make Your Own Cat Food? For starters, you will know exactly what’s in your cat’s food because you put it there yourself. Dry kibble tends to be loaded with carbohydrates and plant based proteins. Worse, it is often contaminated by bacteria, fungal mycotoxins and even vermin and their excretions. Dry food also does not have a high enough moisture content for cats. Many people remember the mass pet food recalls in 2007 after many unfortunate animals experienced renal failure after eating contaminated food. If you cook your cat’s food yourself, you will know exactly what she’s eating and, almost as importantly, what she’s not eating. Now let’s talk about costs. Will it be cheaper in the long run to cook your own cat food? That all depends. Are you using chicken or rabbit? Unless you own a warren, chicken will usually be cheaper. Are you getting your ingredients from Whole Foods, a typical grocery store or the farmer’s market? Do you want to use supplements? Just how much does your cat eat? How much should your cat be eating? Do you prefer organic? Will you be willing to do your own prep work? When considering how much your food bill will be for your cat, it’s a good idea to weigh it against a possible vet bill. Cats that eat healthy are healthy and won’t need to see a vet as often. Plus, a healthy cat is a happy cat. While cats are partial to routine, they do like some variety in their diet. Making them something new every few days is much better than giving them the same food day after day, only for them to turn their noses up at it out of boredom. To quote a popular meme, “Why not both?” People who are against raw food are worried about parasites and bacteria. People who are against cooked food are concerned about the loss of nutrients. In this case, it’s better to look at the positive benefits each side has, use a little common sense and compromise. Consider par-cooking, heating it just enough to eliminate the surface bacteria. Keep in mind, your cat has different nutritional needs than yours. She can eat not only raw meat, but the organs that you might find disgusting. However, older pets being transitioned to homemade food and cats with sensitive or damaged gastrointestinal tracts might benefit more from cooked foods. If you do cook meat for your cat, she might not only prefer it to be very rare, but it’s more nutritionally sound for her. Rare meat still has those healthy enzymes while all surface bacteria has been killed off, plus it’s still nice and moist. Avoid sausage meat and other manufactured meat as they contain sulfite preservatives that are not good for cats. In any case, consult a veterinarian before feeding your cat anything out of the ordinary for her. The one place where raw versus cooked comes down to one or the other is when bones are involved. If your cat gnaws on bones, they should be raw rather than cooked as cooked bones can splinter and hurt your cat. Even then, supervise your cat’s gnawing and remember that more than one or two a week can lead to constipation. The cat is an obligate carnivore. She needs meat to survive. Some cat foods will try to tout themselves as “high protein” only for it to be later revealed that the protein sources were soy, nuts, lentils or wheat gluten. This will not do. A cat can only digest protein from animal sources. The domestic cat has the shortest digestive tract to body size ratio of any mammal. This makes it very hard for them to digest plant based protein. You might want to cut down on fat but your cat doesn’t! She needs easily digestible fats for energy. Specifically, she needs omega-6 fatty acids such as linolic and arachidonic acid. Fish oil, krill oil and flaxseed are all good sources of omega-3 fatty acids but you can also use poultry, beef and pork to get that healthy animal protein as well. If your cat has pancreatitis, you may want to feed her something lower in fat. Calcium and phosphorus are necessary for strong bones and teeth. Calcium is also needed to help blood clot and phosphorus boosts the reparation of cells. Phosphorus will help your cat metabolize protein and calcium helps those lightning quick muscles work. Small fishes like sardines and anchovies are calcium rich because their bones are tiny enough to be edible. While phosphorus can be found in nuts and beans, your cat will get more out of fish and poultry. This is a crucial amino acid that your cat cannot create for herself and must get it from the food she eats. Natural sources are lamb, beef, eggs, shellfish, cold water fish, brewer’s yeast and dark chicken meat. Boiling meat can destroy the taurine present. Cats that do not eat enough taurine have vision and heart problems along with a general failure to thrive. It is available as a vitamin supplement. The powdered form may be easiest to cook with. Cats don’t usually drink as much water as they should. Their wild ancestors lived in dry climates and they got most of their needed moisture from prey. Because of this, a modern cat has little instinct to drink water. What’s more, cats can be picky about what kind of water they drink. Feed your cats food that’s good and moist to make sure she’s staying hydrated. She may like her food mixed in with a little meat based broth (preferably no salt added) to make it more succulent. Your cat needs her vitamins and would be better off getting them from food sources than supplements. Cats can’t convert beta-carotene from plant sources into vitamin A, so it needs to come from an animal source such as halibut, liver and kidneys. Beef liver is also a good source of vitamin D as are tuna, mackerel and salmon. To help your cat have a healthy coat, vitamin E can be found in eggs. The B vitamins are essential to a cat’s well being and can be found in liver, brown rice, poultry, fish and red meat. This is no time to get experimental. You might like a little pep from onions and garlic, but your cat certainly will not. Raw egg whites might have looked like they were good for Rocky Balboa, but they’re not for your cat. While cats can safely eat many foods raw, eggs are a big exception. Tomatoes, grapes and anything made with grapes should not be given to your cat. Chocolate is a big NO as is anything with caffeine. Adult cats can’t process most dairy products. Keep the sherry in the cabinet. Your cat can’t taste sweets and sugar isn’t very healthy anyway. It’s at the top of the list for a good reason. Your cat is a carnivore, so her food should be almost entirely meat based. Whether you feed your cat raw or cooked meat, do be sure to follow safe handling protocol. It should be either rather hot or rather cold and for everyone’s health, wash your hands. Beef, pork, rabbit and fish are all good sources of animal protein for cats. Organ meats like liver are full of vitamin A. If you cave a hunter in the family who wants to give your cat a little venison, only let them eat muscle meat that’s been at least partially cooked. While cats like tuna, canned tuna is not very good for them. Lamb and mutton are a bit high in fat, but your cat might like a little every once in a while. The meat in any case must be fresh and not processed. Do not let your cats have cooked bones. As noted before, cooked bones splinter too easily and can hurt your cat either internally or externally. Raw bones are a good source of calcium and are good exercise for the teeth. If you feed your cat fresh fish, make sure to take out the bones first. While a cat might love to gnaw on a fresh bone, it should be done sparingly and under supervision. If you use bone meal in your homemade cat food, use the kind made for consumption and not the kind for gardening. Better yet, grind the bones yourself. It’s easier than it sounds. Calcium carbonate not only provides necessary calcium but is a natural preservative. Do keep in mind that your cat can have too much of a good thing where calcium is involved. Don’t overdo it. The liver is the number one source of vitamin A for your cat. Kidneys are full of B vitamins and iron. Other offal your cat might like includes the heart, tongue and tripe. Raw green tripe might look and smell disgusting to you, but your cat will love it. Heart, a good source of vitamin B12, iron and phosphorus, should not be overcooked if at all. Beef tongue has plenty of B12, iron and zinc but also cholesterol, so watch the portion sizes. Brain is considered a delicacy by some people (no, not just zombies), but care must be taken so that your cat doesn’t eat something infected. It is better for your cat to get vitamins, minerals and other nutrients from the food itself, but a supplement may be beneficial depending on the circumstances. Powdered or liquid forms are the easiest to cook with. If your cat needs a vitamin supplement but won’t swallow pills, mixing a vitamin powder or liquid in her food may be the easiest way to get her to take it. Always check with your veterinarian before feeding your cat a vitamin supplement and do not exceed the recommended dose. Please check with your vet before feeding any of these recipes to your cat. If your cat has certain diseases or allergies, some of these recipes as is may not be appropriate. With credit to The Natural Pet Food Cookbook by Wendy Nan Rees and Kevin Schlanger DVM. Remove chicken and strain broth into a bowl. Chill broth in refrigerator until top is covered in fat. Skim fat. Remove fat, skin, and bones from chicken. Discard. Cut meat into bite sized pieces. Set aside. Return broth to pot. Add chopped celery with carrots, barley, brewer’s yeast and lemon juice. Cover and simmer 20 minutes. Add chicken, spinach and green beans. Cook 15 more minutes until beans are tender. Cool and serve. It will keep refrigerated for one week or frozen for a month in an airtight container. Remove and discard roughly half of the skin and 20% of the bone. Dice and slice most of thighs into small bite-sized portions. Grind the rest of the thigh meat, bones, hearts, and liver. Stir until well blended. In large bowl, combine all vitamin supplements, eggs, and salt. Add 2 cups of water. Eggs should be well whisked. You will now have three main mixtures; sliced/sheared meat, ground meat/bone, and supplements beaten with eggs. Combine and mix all ingredients thoroughly. The leftovers must be stored in an airtight container that allows room for expansion as the food freezes. You can put a few days worth of the meal in the refrigerator and freeze the rest. It is best if served immediately but you can refrigerate the leftovers up to three days. Puree until blended and serve. As with mackerel dinner, leftovers can be stored in the refrigerator up to three days. Place ingredients in food processor with tablespoons of the chicken broth. Puree or crumble the ingredients until it resembles pate cat food. Gradually add broth until mixture is smooth but not soupy. Mash all ingredients together until a paste-like mixture forms. Shape into balls and place on greased baking tray. Bake for 20 minutes. Check frequently. When they are golden brown and firm, they are ready. As with trout and mackerel dinners, you may refrigerate leftovers. Discard them after three days. Make six or seven balls. Form into patties. Serve and store leftovers in the refrigerator. Mix milk powder and a small amount of water together. Pour the mixture into small non-stick frying pan. Cook over medium-low heat until done. Flip as you would a pancake and spread cottage cheese and vegetables over half of cooking surface. Fold as you would an omelet. Cool and cut into bite-sized pieces before serving. Remember that a chef’s mise en place includes cooking implements such as knives, bowls, pots and pans. You may already have some of the following items, but if you don’t here are some good options. As stated before, pre-ground meat is unsanitary, but if you do your own grinding at home and keep your grinder clean you can rest assured that your ground meat is completely free of harmful bacteria. One of the most popular brands on the market is the STX International STX-300 Turboforce electric meat grinder and sausage stuffer. It has three speeds and comes with size #12-4 grinding plates, 3 stainless steel blades, 3 sausage tubes and Kubbe. While this is a heavy duty model, it is meant for the home kitchen and is not recommended for bones, tendons or feet. The blades are made with hardened/tempered steel and everything is ready to use right out of the box. It’s easy to disassemble for cleaning. For results, consult the user’s manual for tips. Chicken skin can be pretty slippery, so you’ll want a good pair of poultry shears to help quarter your chickens. 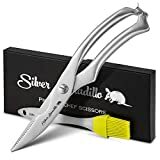 Silver Armadillo makes a good pair of stainless steel heavy duty poultry sheers that comes with a silicon basting brush. They can easily cut through bone but are not designed for raw skin. 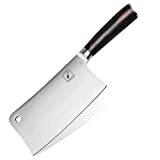 You need the right tool for the job and that means a cleaver for cutting meat. iMarku creates cleavers with ergonomic handles for an easier and safer use. While this blade is useful for vegetables, do remember to wash it with mild soap and water after using it on meat. For preserving homemade food, nothing beats a good old fashioned Mason jar. That air tight lid keeps out the bacteria and the glass is easy to wash and stands up to high heat. Not recommended for freezing. It’s recommended that you get a 12 piece set of Ball Mason Regular Mouth Quart Jars. Ball wide mouth quart jar. The size of the jar is based on filling it to the rim. Cooking food for your cat is a bit of an adventure, but both you and your cat will enjoy the rewards! Talk with your veterinarian before making any drastic changes to your cat’s diet. Make sure your cat eats only what’s good for her and gets all the vitamins and minerals she needs. Bon appetite! Nutritional Problems in Cats: Taurine Deficiency and Vitamin A Excess, K. C. Hayes – Can Vet J. 1982 Jan; 23(1): 2–5. Consumption of sugar and sugar-sweetened foods and the risk of pancreatic cancer in a prospective study Larsson SC, Bergkvist L, Wolk A, Division of Nutritional Epidemiology, National Institute of Environmental Medicine, Karolinska Institute, Stockholm, Sweden. Am J Clin Nutr. 2006 Nov;84(5):1171-6. Adverse reactions to the sulphite additives by Hassan Vallycorresponding, Neil LA Misso – Gastroenterol Hepatol Bed Bench. 2012 Winter; 5(1): 16–23.